The March 26th issue of Woman’s World Magazine features the Daniel Fast on the cover! The article includes a lot of information about the fast and the great benefits for health and weight loss. One of the editors of Woman’s World Magazine contacted me after reading my book about the Daniel Fast. I also pointed her to Richard J. Bloomer who is an associate conducting detailed clinical research about the Daniel Fast at the University of Memphis. This is great exposure for the Daniel Fast and my hope and prayer is that more and more men and women will see the tremendous benefits of the Daniel Fast for the spirit, soul and body. You can also see in the Woman’s World article that a lot of medical professionals are seeing the value of this way of eating! One thing is VERY important and that is to follow the eating plan described in my book. There is a lot of erroneous information out there about the Daniel Fast and it’s steering people in wrong directions. I’ve been researching the Daniel Fast since 2007 after I followed a very specific directive from the Lord. I’ve answered thousands of questions about the Daniel Fast and researched just about every aspect of the experience. Yes, the Daniel Fast is a great method for extended fasts (7-50 days). We are Standing with you for the healing and complete restoration of your mother’s health in Jesus Strong Name! I am about to complete my first Daniel fast tomorrow. I have enjoyed the intimacy I have experienced with God. I started the fast for healing for my mother because she was undergoing brain surgery. I threw myself into the fast because of complications that arose with her that threaten her life and delayed the surgery. Thanks be to God the complications subside and God brought her through the brain surgery yesterday. I am scheduled to end the fast tomorrow but I am considering staying on the fast because she is not able to see out of her left eye after the surgery. I feel in my spirit that God will restore her vision in her eye. All this to say, do you think it would be safe to continue the fast for another 21 days. I am hungry for God’s intervention and healing for my mother and I really developed a daily time in he word and prayer that is enhanced with the fast. I have seen how the fast has impacted me and my mom mentally, spiritually and physically. I just want more of God and more of His Glory to shine through this situation. I hope I am making sense. Thank you for time. I love the fact that Womens World did the article, that’s how I found out about the Daniel Fast. However it presented it as a diet which is why I bought the magazine. I am so greatful it is more than that, but I am having a hard time not focusing on the food as much as I do on a diet. I am giving it to the Lord every day. Woman’s World is where I found you! The timing was heaven-sent. Hi Susan,,I run a SMS Fast n Praying group in South Africa. Our identity name is the Ari-els. 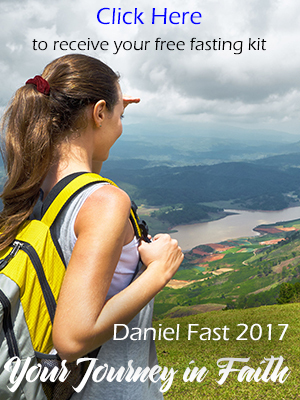 From 1st April we’re planning to do the Daniel’s Fast for 21 days – a first for us – we all need God’s input into our lives. I really learned a lot from the Daniel Fast, both physically and spiritually. My entire church did the fast and I feel it was very helpful for everyone involved. I am reading my Bible more and learning more about Jesus and praying even well after the fast. I thank you for creating a beautiful experience and I look forward to doing it again. Thanks again.